Cherry angiomas are common skin growths that can grow on most areas of your body. They are also known as senile angiomas or Campbell de Morgan spots, and they are usually found on people age 30 and older. The broken blood vessels inside a cherry angioma give them a reddish appearance. This type of skin growth is typically not a cause for concern unless it bleeds often or changes in size, shape, or color. Talk to your doctor if you notice any changes in appearance or bleeding; these could be symptoms of skin cancer. 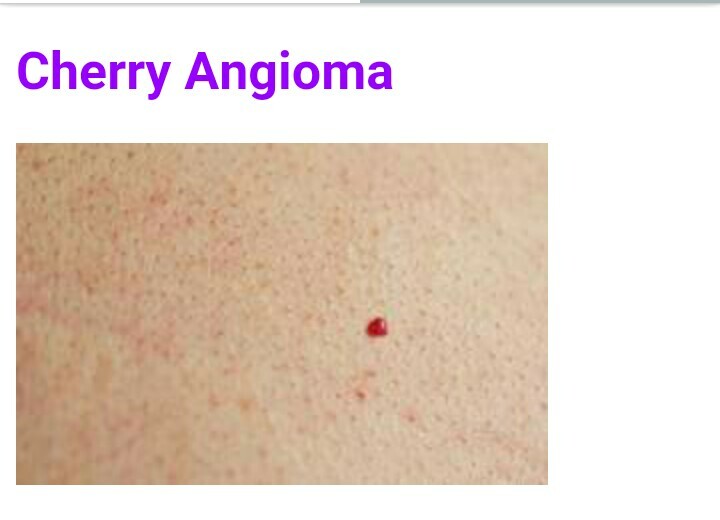 A cherry angioma is bright red, of a circular or oval shape, and small—ranging in size from a pinpoint to one-fourth of an inch in diameter. Some cherry angiomas appear smooth and even with your skin, while others appear slightly raised. They most often grow on the torso, arms, and shoulders. Bleeding can occur if the angioma is scratched, rubbed, or cut open. The exact cause of cherry angiomas is unknown, but there may be a genetic factor that makes certain people more likely to get them. They’ve also been linked to pregnancy, exposure to chemicals, and climate. There also appears to be a link between cherry angiomas and age. They often begin to appear when individuals reach age 30, and seem to increase in size and number with age. If you notice any changes in the way a cherry angioma looks, schedule an appointment with your dermatologist. It is important to have any type of lesion or growth looked at when its appearance changes so that your doctor can rule out serious conditions, such as skin cancer. Your doctor may decide to do a biopsy, which involves removing and examining a small sample of the angioma, to diagnose or rule out other serious conditions. How Are Cherry Angiomas Treated? This surgical method of treatment involves burning the angioma by using an electric current delivered by a tiny probe. For this procedure, you will also have a grounding pad placed somewhere on your body to shield the rest of your body from the electricity. This procedure involves freezing the angioma with liquid nitrogen, and the extreme cold will destroy it. This method is known for being a quick and relatively easy procedure. You only need one treatment session for cryosurgery to work, and the liquid nitrogen is usually sprayed for only about 10 seconds. The wound doesn’t require much care afterward, and there is a lower chance of infection compared to other types of surgeries. This type of surgery involves using a pulsed dye laser (PDL) to get rid of the cherry angioma. The PDL is a concentrated yellow laser that gives off enough heat to destroy the lesion. This method is quick and is done as an outpatient procedure, which means you will not have to stay in the hospital overnight. Depending on how many angiomas you have, you may need between one and three treatment sessions. This surgery can cause slight bruising, which can last up to 10 days. This procedure involves slicing away at the angioma in thin layers until it’s gone. Shave excision is an alternative to invasive surgery that would involve cutting out the lesion or growth and using stitches or sutures to close the wound.